Motor Trend has recently named Alfa Romeo’s Giulia Car of The Year. This is a milestone for Fiat Chrysler, the Italian-American car company that has been working on introducing the perfect luxury car to an upscale market. Motor Trend chose Giulia because it shines lustrously among the status quo of cars formulaically mass produced. “There is sorcery in this car,” remarked Motor Trend’s road test editor Chris Walton. This vehicle can cast a spell on its driver. One of the judges involved in this decision said, “This car saves the sport sedan market,” as it doubles as an exhilarating sports vehicle with lateral grip, and by adjusting the throttle, it becomes the prime way to get to and from work on the highway. 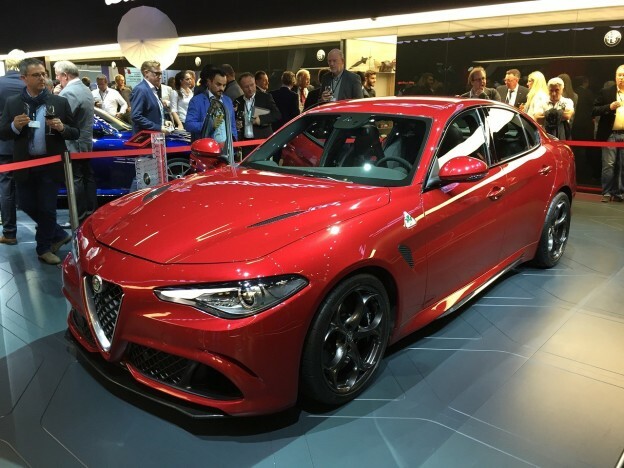 The Alfa Romeo Giulia is a well-equipped luxury sports vehicle that is more than just easy on the eyes. This impressive vehicle doesn’t disappoint when it comes to what’s under the hood with a 505-horsepower engine. The car comes with its own safety and security features that include Integrated Brake System, Forward Collision Warning Plus, Available Safety, Advanced driver assistance and much more. Test drive this award-winning vehicle today at THE COLLECTION, the Ugo Colombo Miami dealership that houses several luxury vehicle brands. This entry was posted in News, Ugo Colombo The Collection and tagged Alfa Romeo, The Collection, Ugo Colombo, Ugo Colombo Miami, Ugo Colombo The Collection on December 5, 2017 by Ugo Colombo.